Pixpa allows you to connect WHCC lab to the auto fulfilment of your client galleries orders. Don’t have a WHCC account? Click here to create your WHCC account (You need to be a resident of USA). Click here to see how to connect WHCC account. 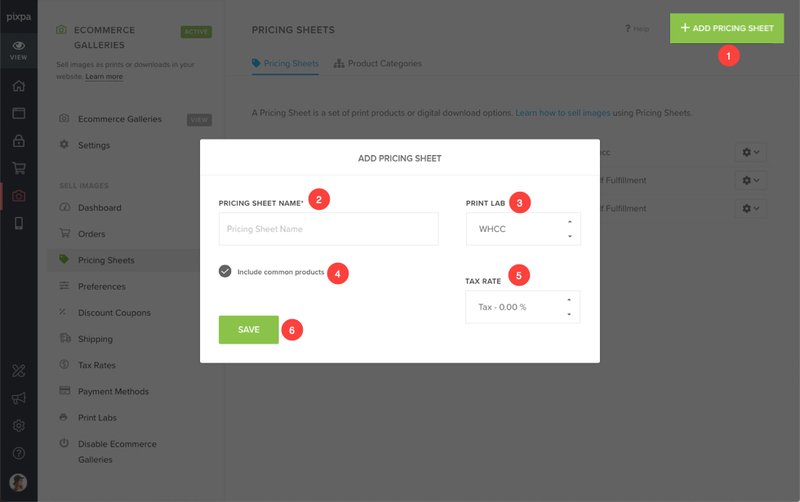 Once you connect the WHCC account, you need to create WHCC pricing sheet. 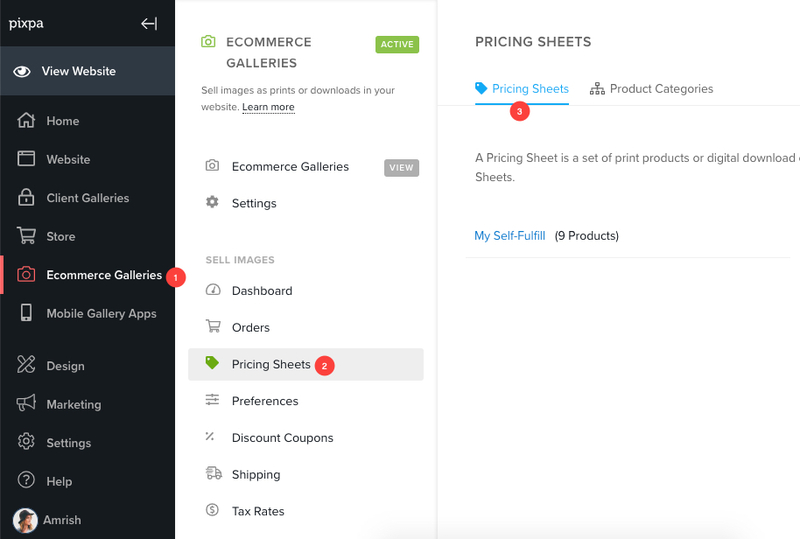 You can also edit (1), duplicate (2) or delete (2) any existing pricing sheet from here. Click on Add Pricing Sheet (4) button in right top to add a new pricing sheet. Pricing sheet name: Add your pricing sheet name like “My WHCC pricing sheet” etc. Include common products – Check this to include common WHCC products in your pricing sheets. Print Lab – Choose WHCC here to process all orders by WHCC lab. Note: If you want to fulfil your orders manually, setup self-fulfilment pricing sheet and to automate the self fulfilment, setup custom lab. Tax rates – Choose your tax rate for this pricing sheet. Know more. Save – Click here to save the changes. 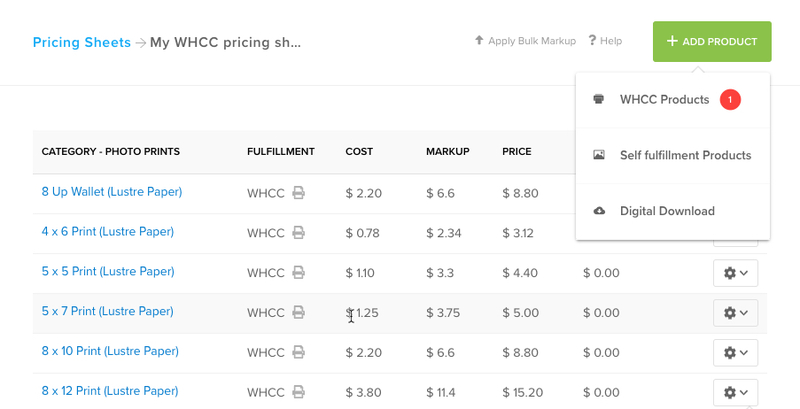 In the next step, you would see your newly added WHCC pricing sheet. 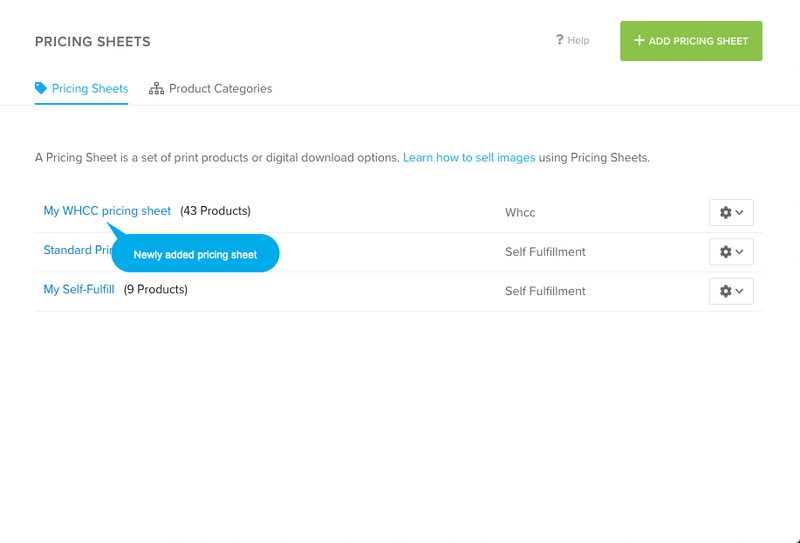 Click on the pricing sheet name to edit the products in it. 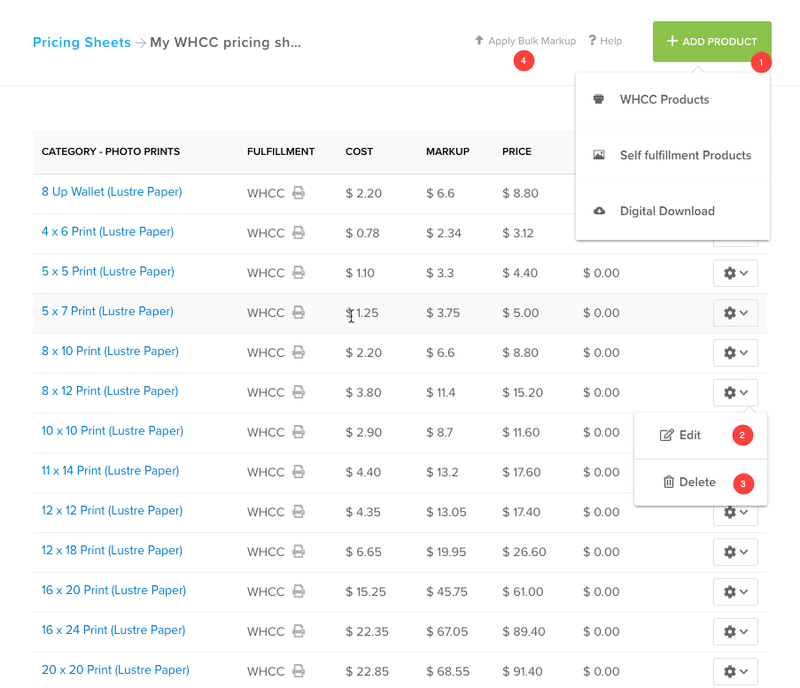 Open the WHCC pricing sheet where you want to manage the products. To add a new product, Click on Add Product (1) button in top right corner, you would see an option to select which type of product you want to add i.e. WHCC Products or Self fulfilment Products or Digital Download. You can also edit (2) and delete (3) any existing product by clicking on settings icon next to it. On clicking on Add product tab, You would see the option to add WHCC products. Click on it. On the next step, you would see a pop up where you can add/remove the products. Here you would see all the WHCC products which are supported by Pixpa at the moment. Just select the particular product and hit save button to add in the pricing sheet. You can choose from Lustre Prints, Metallic Prints, Deep Matte Prints, Gallery Wraps Canvas and Metal Prints in various sizes. Scroll down to see the complete list. 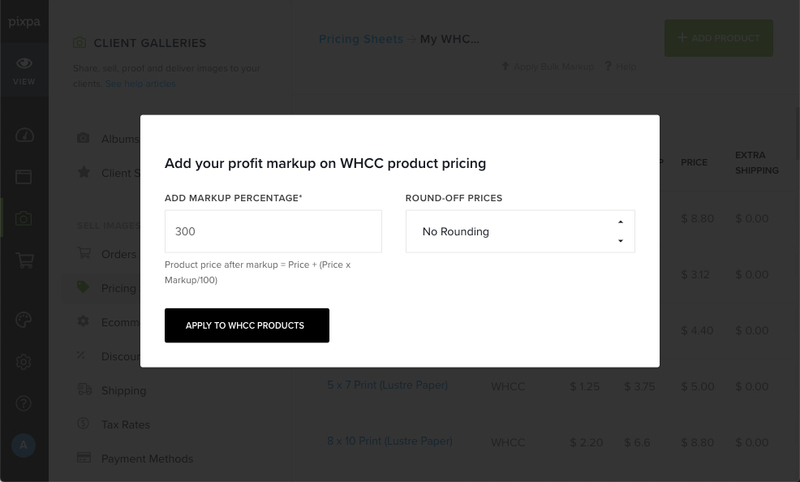 You can add your profit markup on default WHCC product pricing. In the next step, You would see a pop-up window, add your markup percentage here like 200, 300, etc. You may also round-off the final product prices like round-off to .99 or .00. Final product prices would be 405.99, 463.99 or 405.00, 463.00 respectively. You may also leave as it is by selecting nothing. 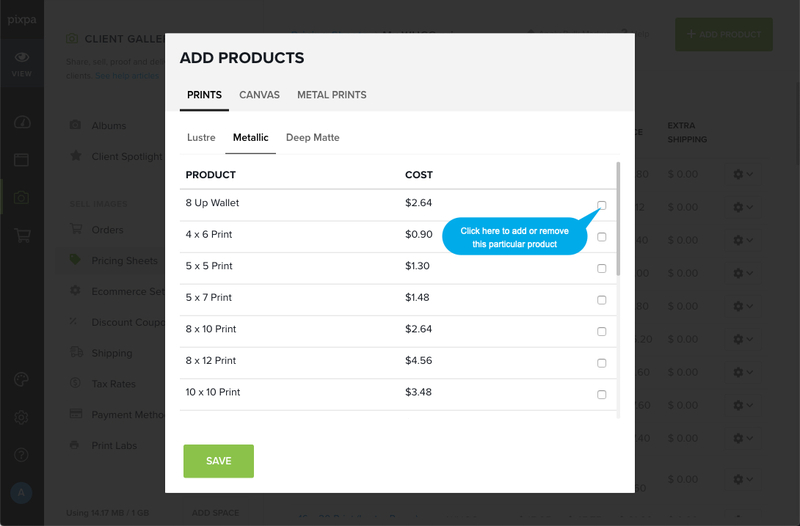 Then hit the apply button to save your markup on all the products. That’s it. Note: The system would save your last applied markup and round-off value that means if you add any WHCC products in existing pricing sheet, the system would use the same markup and round-off value to the newly added product. Pixpa allows you to add Lustre Prints, Metallic Prints, Deep Matte Prints, Gallery Wraps Canvas and Metal Prints in various sizes at the moment. 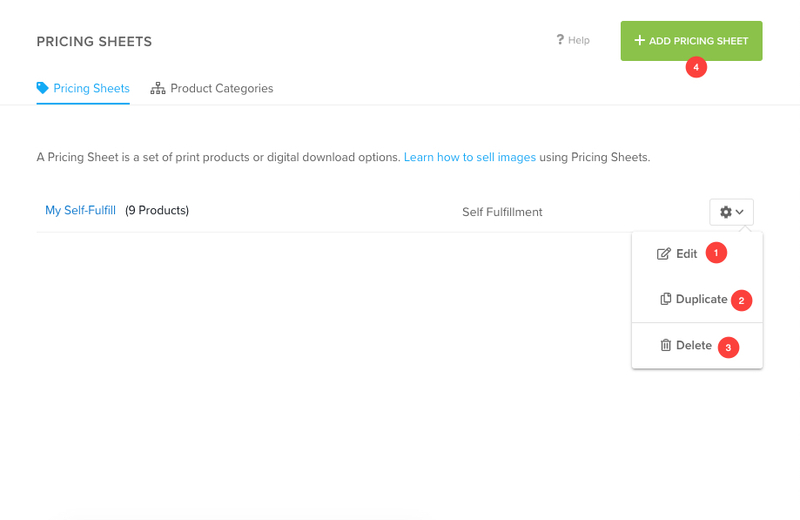 Here is the list of products in which you can sell your images with WHCC auto fulfillment. WHCC (White House Custom Colour) lab support and process only JPEG files at 300 ppi. Anything lower then that typically results in a less the clear image/print. Click here to know more. Click here to see how to apply a pricing sheet to an album.